Very happy with the results of our two young Shiny Sensation’s at the IDS in Goes NL. Misty (Born to be Famous) and Dana (Rich and Famous) both were entered in youth class, Misty won the class, became best youth and also got the res. CAC. 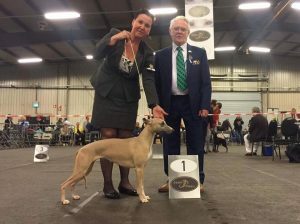 Her sister became second in the same class handled by Bart Scheerens, co-owner.